Anchovy refers to 144 species of small, oily, salt-water fish. Anchovies may be gutted, salted, then packed in oil or salt; served fresh; pickled in vinegar; or become a component of a variety of condiments or sauces. 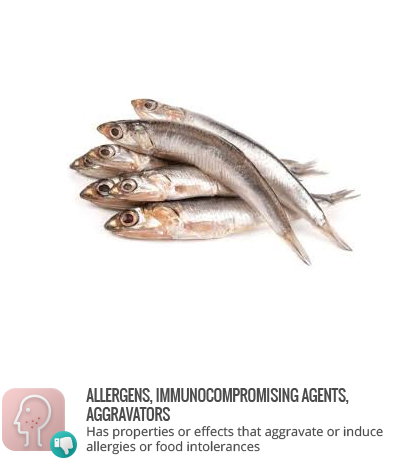 In Sweden and Finland anchovy typically refers instead to sprats. Anchovies are a source of a variety of minerals (including selenium, iron, and calcium), vitamins (including vitamin E, K, and B vitamins), and omega-3 fatty acids. Being low on the food chain, anchovies are low risk for mercury accumulation. Cured anchovies may contain high levels of sodium and consumers should take note of what oil, if packed in oil, is used in jarred or canned anchovies. Fresh anchovies are relatively low in sodium with the same beneficial micronutrients. Cured anchovy fillets may contain small, edible bones. However they may present a choking hazard and caution should be exercised. With cooking the bones typically soften and become unnoticeable.